Villanova owns a number of paintings donated by Princess Eugenia Ruspoli; her adopted daughter, Princess Maria Theresa Droutzkoy; and her daughter’s husband, Prince Alexis Droutzkoy. Who are these donors and what did they collect? 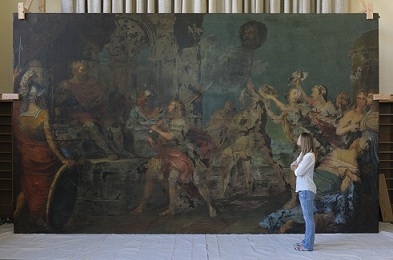 The massive painting, “Triumph of David,” by Pietro da Cortona, which is currently undergoing conservation in Falvey Hall’s Reading Room, is only one of a number of paintings donated by the two families although it is certainly the largest. Princess Eugenia Ruspoli, donor of “The Triumph of David,” was born Jennie Enfield Berry in Alabama in either 1861 or 1869 (date varies according to the source consulted), the oldest daughter of a Confederate army colonel and plantation owner, Thomas Berry, and his wife, Frances Margaret Rhea. Before her first marriage, young Jennie Berry had traveled and studied in Europe. On May 7, 1889, Berry married a wealthy, older man, Henry Bruton, head of the American Snuff Company. Bruton died in 1892, making Jennie Berry Bruton a wealthy, childless widow who soon resumed her European travels. With funds provided by Eugenia, she and Enrico Ruspoli purchased the Castle Nemi, parts of which date to the 10th century. 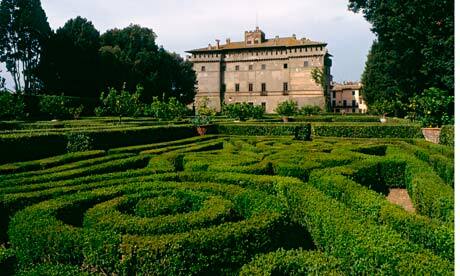 The castle, still standing, is 20 miles south of Rome and near the papal summer palace, Castel Gandolfo. She provided the cash; he provided a title to support their aristocratic Italian lifestyle. Prince Enrico Ruspoli died in 1909 only eight years after their marriage. Despite a verbal agreement with his wife, Prince Enrico Ruspoli wrote a will in which he left the castle and most of his property to his own Ruspoli family. Princess Eugenia Ruspoli challenged the will and, after years of litigation, she received the title to the castle and whatever personal property it contained. Presumably, this personal property included the grand “Triumph of David” donated by Princess Ruspoli to Villanova University in 1950. Were the other paintings she eventually donated to Villanova part of the contents of Nemi Castle when she and her husband purchased it, or did they, with her funds, collect additional works of art? And did she continue to collect after the prince died? After becoming a widow for the second time, Princess Eugenia Ruspoli frequently traveled between Italy and the United States and eventually made her home in New York City. After the outbreak of World War II she shipped some of her art and furniture from the castle to the United States, a wise choice because the castle was later damaged by a bomb, leaving “The Triumph of David” exposed to the weather. After the war, Nemi Castle was inhabited by families of Italian squatters who had little respect for the historic property. This and the war-time damages led to additional litigation which continued even after Princess Eugenia Ruspoli’s death. In 1929 Princess Ruspoli adopted her six-year-old niece, Maria Theresa, who later married Prince Alexis Droutzkoy, a white Russian from St. Petersburg. 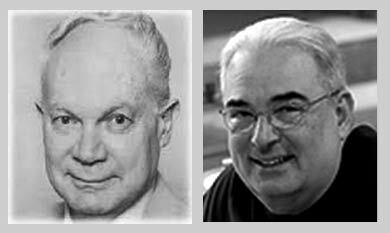 Droutzkoy came to the United States in 1926 as a journalist, attended Columbia University, became a naturalized citizen and editor of Bachelor magazine and later editor of American Helicopter magazine. He and his wife were active socially. Prince Alexis Droutzkoy died in 1976. His wife, Maria Theresa Ruspoli was born in Norwich, England, in 1923. She became an American citizen in 1945; by this time she was married and well-traveled. Additional information about Princess Maria Theresa Droutzkoy is sparse except in reports of various society events in New York and elsewhere. We do know that the Droutzkoys were Princess Eugenia Ruspoli’s heirs. Now for their art collections: from information provided by the Rev. Richard G. Cannuli, OSA, and in the Villanova University Art Collection: A Guide (1986) by George T. Radan and Father Cannuli, we can get a sense of their tastes as collectors. With only two exceptions, the paintings in both collections are Old Masters. These paintings are either Italian or Flemish works created from the 1500s through the 1700s. The two exceptions are an undated work by an English artist, Samuel Prout (1783-1852), “Interior of a Cathedral Scene,” an oil painting on canvas, and an undated “Church Choir Boys,” oil on canvas, by C. De Antonio. The only C. De Antonio I discovered is Cristobal de Antonio, a Spanish artist (c.1862-after 1905). The subject of each of these paintings is the interior of a Gothic style cathedral or church, much like the paintings by the Dutch Baroque master, Saenredam. These paintings are listed in the Villanova University Art Collection: A Guide as gifts from the Droutzkoys, but are not in the recent inventory mentioned below. According to the current inventory created by the University Art Gallery director, Princess Ruspoli donated seven paintings (including Cortona’s “Triumph of David”) and the Droutzkoys donated an additional seventeen paintings. The older list in the Villanova University Art Collection: A Guide says Princess Ruspoli donated six paintings (the Cortona included) and the Droutzkoys gave eight. All paintings in the current inventory have been conserved with one exception. The works were brought from off-campus storage and locations on campus and briefly housed in the Reading Room last fall so that the conservators working on “The Triumph of David” could study them. I was able to visit this collection several times – a truly fascinating experience. Not all of the works are by famous masters, but they are all wonderful representations of their art historical periods. All feature religious subjects, including a “St. Thomas of Villanova Giving Alms” by Jacob Jordaens (Flemish, 1593-1678, attributed to or workshop of). Radan and Cannuli (Villanova University Art Collection, p. xv) say, “ …[T]he authorship supplied by the donors has been accepted by the curators of the collection.” And that leads to an interesting question: is there another painting by Pietro da Cortona in the University’s collection? Listed as a 1952 donation by Princess Alexis Droutzkoy is an oil painting, “Adoration of the Magi” by Pietro Berretini. Pietro Berretini is the birth name of Pietro da Cortona, the artist of the large painting undergoing conservation in the Reading Room. Princess Ruspoli made her gifts in 1949 and 1950. The Droutzkoys gave the bulk of their gifts from 1952 through 1957 plus a “Resurrection” painted by an anonymous 16th century Italian which was donated by Princess Droutzkoy in 1973. 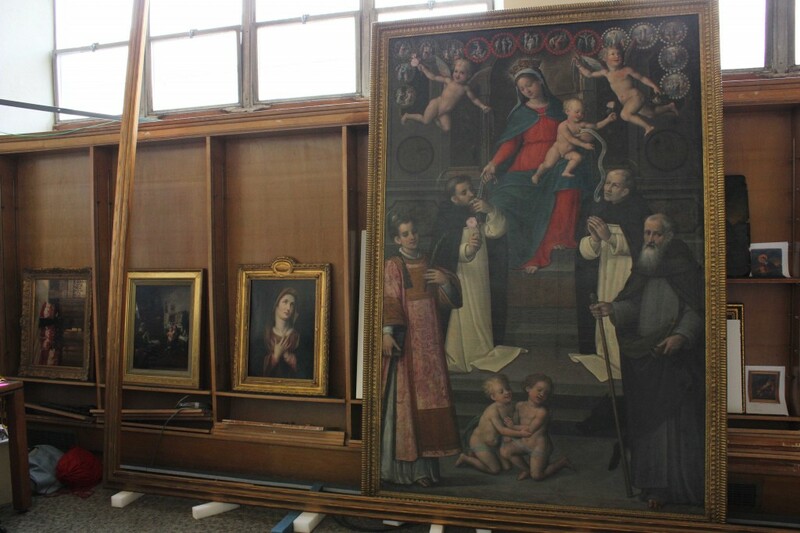 Two large paintings, “Madonna of the Rosary” by Cosimo Daddi, donated by Eugenia Ruspoli, and a 1614 Nativity triptych (a three-paneled work) by an anonymous Flemish master donated by the Droutzkoys are especially impressive. And true to the wishes of the Rev. Daniel P. Falvey (1906-1962), the former library director for whom Falvey Memorial Library is named, the Library will once more display an art collection. “… [H]e wanted the objects of his collection to be permanently housed in the Library of Villanova College. The aesthetic pleasure of viewing the paintings would enhance any student’s visits to do research. … Not only did he himself place the objects strategically at various locations in the Old Library, but he also secured donations (such as those of the Droutzkoys) to improve the scope of his garden.” (Villanova University Art Collection, p. xiv). How inspiring to be able to study in such a vast, high ceilinged space surrounded by Old Master paintings.